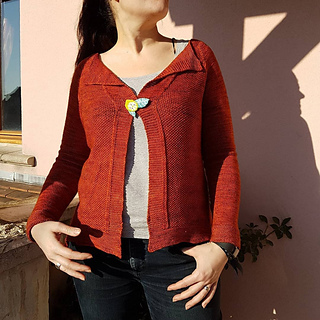 This cardigan is knitted from top down seamlessly. You will start with the neck in garter stitch, then you will increase raglans, then separate the body and the sleeves, finally you will knit the body back and forth until end. There is some moss stitch and some stockinette stitch on front. The back is knitted in stockinette stitch with a lace panel in the middle. 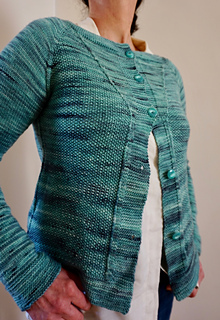 The cardigan ends with garter stitch, the back is a little longer than the front with some short rows. 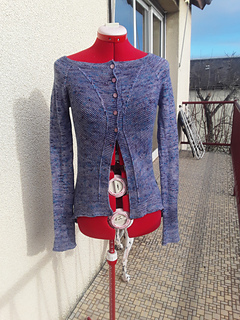 The buttonhole is knitted in garter stitch at the same time as the body. 52¼ inches; 85 (95, 101, 110)119, 125, 133 cm. 23, 24)25, 26, 27 cm. 15¾, 17 inches; 27 (28½, 30½, 33½)37, 40, 43 cm. • front: 12¼ inches; 31 cm. • back: 17¼ inches; 44 cm. other yarn for obtain gauge. 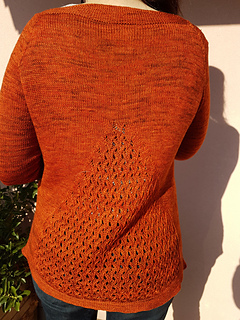 The sample was knitted in size S using Athéna by Lain’amourée - 100% merino – 437 yards; 400 meters – colorway du corail aux lèvres. for weaving, 6 buttons of 0.8 inch; 2 cm of diameter. with Us4; 3.50 mm circular needle, after block.